The BULLSEYE CAP fits on the “lollipop” of the ten-yard chain stick. Helps brand the field to recognize conference affiliation, Bowl identity or for special events such as a BS National Championship Game. 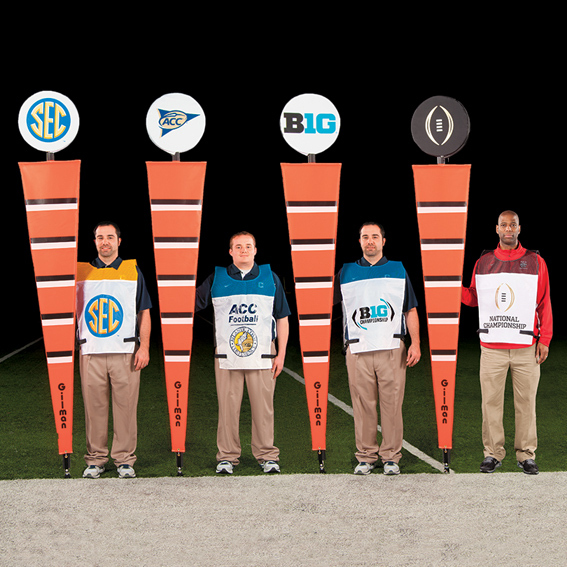 Helps dress up the field and build brand awareness. High exposure value because of sideline location. Base price does not include one-time art charge required to prepare a proof. Additional charge for digital imaging based on quantity. Designed to fit 16" Gilman Bullseye. If using a different brand, size must be specified. Extra charges may apply. For custom Bullseye Caps please call the Gilman Gear office at 1-800-243-0398 to place your order. If you wish to order blank caps, please proceed with your online purchase.